Amaravati: Announcing a fresh action plan to mount pressure on the Centre to grant Special Category Status to Andhra Pradesh, YSR Congress today said the party MPs would not only resign from their posts, but also launch an indefinite fast in New Delhi on the last day of the Budget session of the Parliament. 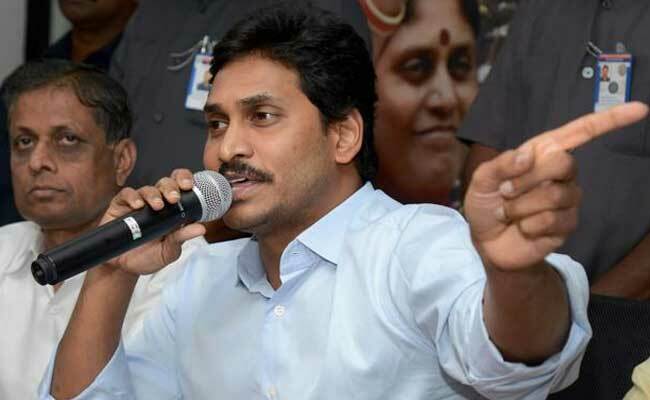 "Our party MPs will resign on the last day of the budget session and march to Andhra Bhavan in New Delhi and sit on an indefinite fast demanding Special Category Status (SCS) to the state," YSR Congress president YS Jaganmohan Reddy said. "Across Andhra Pradesh, there would be relay hunger strikes by students at their respective university campuses and also in all assembly constituencies by party cadres, youth and other sections," Jaganmohan Reddy said addressing a public meeting near Guntur as part of his ongoing paadayatra (foot march). The Leader of the Opposition in the assembly said Chief Minister Chandrababu Naidu has been "resorting to theatrics which could fetch him an Oscar award in the best anti-hero category." "For four years, Chandrababu tried to water down the SCS demand by curbing various agitations... but now he is posing himself as a champion of the cause by raising weak demands and not strongly confronting with the Centre," the YSRC chief alleged. Immense pressure would be mounted on the Centre if all the 25 Lok Sabha members from Andhra Pradesh resigned en masse but the TDP chief had been dissuading his party MPs from quitting only to save his skin, Jaganmohan Reddy said.